Happy New Year! Twenty-five years ago, 1988 was just getting underway and there was no new ARIA chart until January 10. So, to keep us busy until that date in 2013, I thought I'd look back at some of the great '80s groups I haven't already talked about in my personal yearly countdowns, my ARIA recaps or anywhere else on this blog. There's no countdown this time, but, since I crave order and lists, I'll kick off at A and go through to Z (yep, ZZ Top will get a look in) across three posts. Obviously some of the groups started their careers in the 1970s, while others carried on into the 1990s, but I'll be focussing on their '80s output. Another thing to note: I've avoided one-hit wonders (both in the real world and in terms of my own charts) since I'll save that blog post for a rainy day. 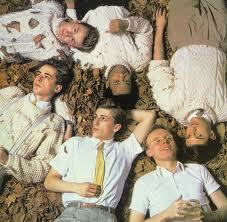 In 1981, it looked like the band fronted by Clare Grogan was going to have a bright future. Altered Images were riding high with "Happy Birthday" (number 2 in the UK, number 23 in Australia) and favoured by both NME and Smash Hits - and while other hits followed (notably 1983's "Don't Talk To Me About Love"), they wouldn't live up to the hype, and broke up after their third album. Singer Clare went on to a regular acting career and, in recent years, has resurrected the band name on '80s retro tours. 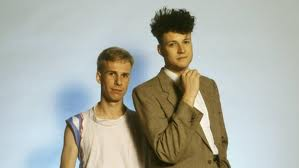 Best known for the Eastern-influenced "Living On The Ceiling" (number 7 in the UK, number 5 in Australia), the duo of singer Neil Arthur and musician Stephen Luscombe struck top 10 glory again (at least at home in the UK) with 1983's "Blind Vision" and 1984's "Don't Tell Me". The singles stopped in 1986, but the pair resurfaced in 2011 with a brand new album. Approximately seven people noticed. Here's another band that's returned to recording in recent years, with new albums in 2008 and 2011 - but it was during the period of 1986-1989 that The Blow Monkeys were at their peak. "Digging Your Scene" was their first big hit (number 12 in the UK, number 16 in Australia) and featured lyrics dealing with the AIDS epidemic (not that I realised that at the time). Led by the ultra-smooth Dr Robert, the group had an even bigger UK hit with "It Doesn't Have To Be This Way" (below) in 1987 and appeared on the mega-successful Dirty Dancing soundtrack. 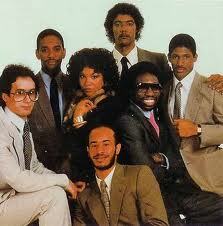 The band's style would evolve by the end of the decade and tap into the emerging house sound, as Dr Robert also did on "Wait", his hit duet with Kym Mazelle from 1989. Music and business don't often see eye to eye, but this post-disco era project - the brainchild of an Italian businessman - was an immediate success at the start of the decade, resulting in a string of classic tunes. The concept was simple enough - songs would be written and backing tracks recorded in Italy, then sent to the States for singers such as a pre-fame Luther Vandross to perform on. First album The Glow Of Love featured the title track (which, decades later, would be sampled on Janet Jackson's "All For You"), as well as "A Lover's Holiday" and "Searching", while half of 1984 album Change Of Heart was produced by Jimmy Jam & Terry Lewis. Almost one-hit wonders, this English band never had a song as big as their debut single, "(I Just) Died In Your Arms" (number 4 in the UK, number 8 in Australia, number 1 in the US). However, their 1987 single, "I've Been In Love Before", also hit the top 10 in the US and Canada, while I'm a fan of their second single, "One For The Mockingbird". Singer Nick Van Eede still tours with Cutting Crew (although the rest of the line-up is different) and a new album was released in 2006. 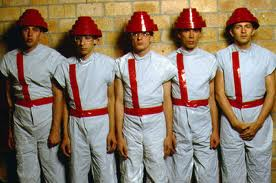 Like KISS, I have vivid memories of Devo from the early '80s - probably because of those hats. The fact they were on high rotation on radio and TV at the time might have also had something to do with it. "Whip It" gets all the attention, but songs like "Girl U Want", "Working In The Coal Mine" and "Beautiful World" were all classics. 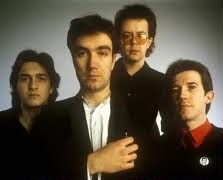 What is often forgotten about their success in Australia, though, is that the band's chart-topping run in 1981 was because of concert EP DEV-O Live and not the single release of "Whip It", which had stalled at number 77 the previous year. That track was, of course, featured on the EP and the memorable music video from the original release received renewed play. Internationally, they're known for their early '90s mega-hit, "I Touch Myself", but locally, Divinyls had been creating shockwaves for years thanks to singer Chrissy Amphlett's schoolgirl attire and, er, memorable onstage presence. Other band members came and went over the years, but Chrissy and guitarist Mark McEntee's presence remained constant throughout the band's initial run and recent reformation. And, although "I Touch Myself" was their biggest hit, "Boys In Town", "Pleasure And Pain", "Hey Little Boy" and "Science Fiction" are just some of the hits in an impressive catalogue. 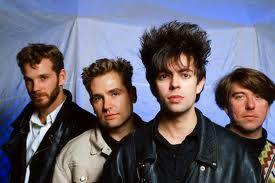 For some reason, I always associate Echo & The Bunnymen with acts like The Jesus And Mary Chain and Siouxsie And The Banshees - probably because they all made music that was on the fringes of what I liked, but were just that little bit too alternative for a pop fan like me. Like many of the bands on this list, they're still (or back) around today - but it's their classic singles like "The Killing Moon", "People Are Strange" and, my personal favourite, "The Cutter", for which they'll always be remembered. Despite the fact that this British band has been around since 1979, I like exactly two of their songs. 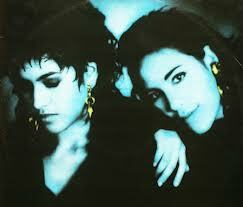 They also just happen to be Fischer-Z's only two hits in Australia: 1980's "So Long" and 1988's "The Perfect Day". Beyond that, I've never known anything about them - and even after checking out the official website run by lead singer John Watts, I'm not much the wiser. Sometimes, though, it's enough to let the music do the talking. If you're not familiar with the music of brothers Charlie, Robert and Ronnie Wilson (aka The Gap Band), you might be surprised just how many of their songs you actually know - since their tracks have been covered and sampled almost endlessly since the period of their greatest success (aka the '80s). Following their launch in 1974, the group hit its stride in the late '70s with the first in a long-running series of self-titled albums, which took them right up until 1987. Despite the less-than-creative album titles, songs like "Early In The Morning", "Burn Rubber (Why You Wanna Hurt Me)", "Outstanding" and "You Dropped A Bomb On Me" dominated Billboard's R&B chart. These days, singer Charlie Wilson regularly contributes vocals to hip-hop tracks, particularly by rappers Snoop Dogg and Kanye West. 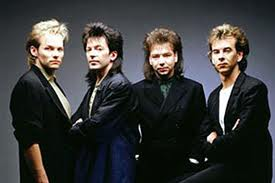 There was nothing like the '80s for a bit of drama among band members - and, like Kajagoogoo, Haircut 100 was a band in which the singer (in this case, Nick Heyward) was sacked at the height of their success, which had seen them enjoy a run of four consecutive UK top 10 hits. 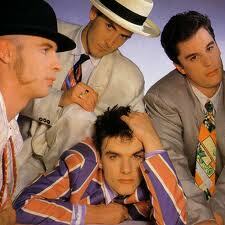 When Nick was abruptly replaced by Mark Fox, the hits stopped just as suddenly, and by 1984, the band was no more. In Australia in the '80s, dance music was a dirty word (OK, that's two words, but you know what I mean) - and despite the chart success of acts like Machinations, Wa Wa Nee, Real Life and I'm Talking, they always struggled for industry acceptance and radio airplay. Fronted by future solo star Kate Ceberano and Zan, sister of Big Pig's lead singer, Sherine, I'm Talking delivered a handful of dance floor fillers, like "Do You Wanna Be", "Holy Word" and "Trust Me", and also tackled the much-covered "Love Don't Live Here Anymore". New Romantics before it was even a term (and they'd probably dispute the label), British New Wave group Japan were ahead of their time - and split up just as their music was really taking off because of the popularity of boys in bands wearing make-up. Singer David Sylvian went on to a briefly successful solo career and Japan staged a just-as-brief comeback in 1990, but by then, the band's moment had well and truly passed. The Jacksons, The Osmonds, The DeBarges, The Wolfgramms... OK, that last family isn't exactly a household name, but in the late '80s, the Mormon siblings from Minnesota were to American what Five Star were to the UK. Songs like "Rocket 2 U", "Cross My Broken Heart" and "Crush On You" (recently covered by dubstep act Nero) were club smashes, while ballad "You Got It All" became an airplay and chart hit, and was later recorded by Britney Spears for her second album. Although success faded, the group has never really split up (guess it's hard to break up with family) and, since there are 17 - yes, 17! - children in the family, there's a never-ending supply of new singers ready to step in for reunion concerts and new records. Strictly speaking, "Taxi Mary" was attributed just to Jo Jo Zep (the stage name of frontman Joe Camilleri), but, since he still had a group of musicians working with him, I'll include it here. 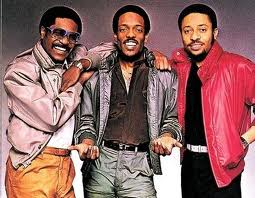 The group had been enjoying hits since the late '70s (particularly 1979's "Hit And Run" and "Shape I'm In"), but their '80s output, like "Taxi Mary" and "All I Wanna Do" are also worth remembering. I'd always assumed the group would've landed a top 10 hit or two, but the highest they ever got was number 11 with "Taxi Mary". Greater chart positions were to come, though, for Joe's next musical endeavour, The Black Sorrows, who peaked at number 9 with 1989's "Chained To The Wheel". 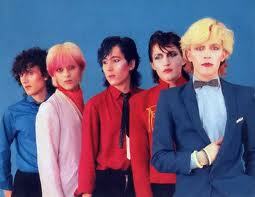 In Part 2, we'll look back at some more classic '80s groups from Kajagoogoo to Psychedelic Furs.